The Armor Style Chest Protector is the newest offering from Champion Sports for umpire safety. This 3mm molded armor with full shoulder coverage is contoured for a fit that hugs the body without compromising range of motion. This model features DryTek™ mesh for wicking away moisture, and EverCleanTM pads that resist bacteria, mold and mildew. 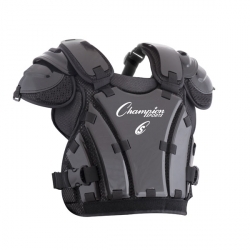 The chest protector is fit with a five point adjustable harness, and has quick release clips.